Justice for Trayvon march walking eastbound across all lanes from the Crenshaw entrance of the 10 freeway. On the Sunday morning of July 14th I caught word of a rally and march calling for justice for Trayvon Martin on twitter to take place at 4:00pm meeting at Crenshaw Blvd. and Martin Luther King Jr. Blvd. I came out to see and hear what people had to say, and I wanted to feel the reality on the ground as it truly exists, unfiltered by the truncated flyover coverage that accounts for so much of broadcast news. I also came out with the dual hats of documenting and live blogging, but also lending my own presence to the frustration that our society remains unfair and unjust, far too often shaped unequally along racial lines. I’m not entirely neutral here, but neutrality doesn’t really exist, and perhaps most especially from some sources that attempt to claim otherwise. I’ll admit upfront I’m no expert on the legal system, and I was not following every turn of the Zimmerman trial (or was it really Trayvon on trial?). Writing from the perspective of a white male currently living in Santa Monica, I am not confronted by the same kinds of prejudice or systemic structural disparities and expectations in my personal life that a Black male would experience in our society. I can recognize that institutional racism exists, but I cannot speak from the same place, I do not carry the same burden. As an idealist, the fundamental unfairness of this dynamic does burn at me, it angers me, but such feelings must pale in comparison to how it must feel to carry the weight of presumed guilt by simply existing as one’s self. When I was a teenager I sometimes walked or biked alone at night on the suburban streets and pedestrian paths where I grew up, but I was never perceived a threat or stalked by law enforcement or civilian self styled authorities. It never crossed my mind that I might be confronted over imagined crimes simply because of how I looked and where I was going. From the night of February 26th, 2012, in Sanford, Florida, to the protests and rallies across the country following the acquittal verdict, the street as public space has been a central part of this story. Trayvon Martin, returning to the home he was visiting, was followed, presumed suspicious, presumed guilty of something, with no evidence as such, for the very act of walking down the street with the “wrong” appearance, in the “wrong” place. He was thought to be surely up to no good because of appearance and prejudice. In much of the popular urbanist discourse the goal of complete streets is invoked, usually to denote particular design features or characteristics. But if there are people in our society who cannot even walk without presumed guilt, than I would contend that no street can be truly “complete”. No sidewalk, no bike lane, no ideal tree canopy, no parklet, can correct for social paranoia empowered by firearms and flawed legal institutions. The street is a social construct foremost. Design features and infrastructure are important, but always secondary. The rally began around 4:00pm at the corner of Crenshaw Blvd. and Martin Luther King Jr. on Sunday, punctuated by chants of “Justice for Trayvon,” “No justice, no peace”. Community leaders and varied speakers that came up also got up to take turns at a mic to voice their own thoughts and frustrations. Hearts and minds were first and foremost on Trayvon and the Martin family, but also palpable in some of the comments were recent defeats or cases of where people felt our legal system was unjust. Such as the Voting Rights Act being struck by Supreme Court, uneven incarceration that continues to disproportionately jail people of color, especially Black Americans. The conditions that exist in those prisons are also being protested by an a California inmate hunger strike going on for more than a week so far. Comparisons were made with the 20 year mandatory minimum sentence for Marrisa Alexander, also from Florida, for firing a warning shot from a gun that did not hit anyone. Alexander was denied invoking “stand your ground”. Justice for Trayvon demonstrators stretching for several blocks marching south on Crenshaw Blvd. 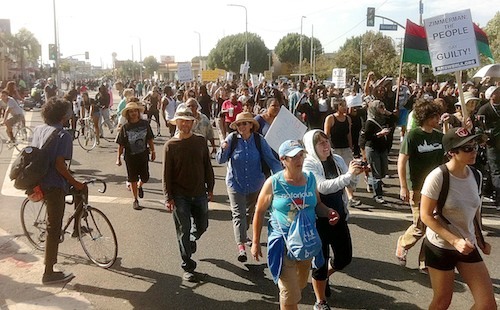 As the gathering grew in numbers that weren’t easily containable to the sidewalk, marching began heading south on Crenshaw in the southbound lanes. It was a diverse crowd, banners and signs held high. 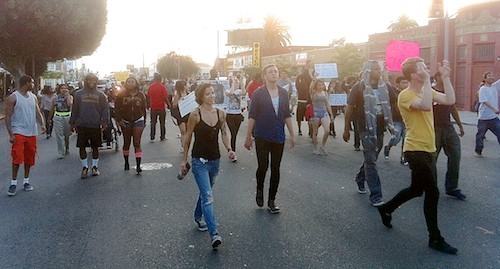 Marching down to 48th, and then turning back up Crenshaw going north, taking both sides of the street by this point. There were chants continuing to call for justice for Trayvon, but also more broadly that “the whole damn system is guilty”, and occasional references to other recent cases including the BART police killing of Oscar Grant, or comparing the acquittal of Trayvon Martin’s killer to historical cases such as the murder of Emmett Till. The street in the era of mass motoring has in it’s day to day function come to be thought of and used by our society as almost exclusively a conduit for vehicular traffic flow with other activities sidelined at the margins. However marching and taking to the streets has a long and important history as part of democratic expression in America. During the course of my live blogging of events I occasionally became a focal point for some on twitter more concerned about traffic delays than whether our legal system in the U.S. is one that truly upholds what could be fairly called justice. I frankly have little sympathy for such complaints. Street marches that go beyond narrowly defined “protest zones” are a valid use of our largest and most visible public realm, and it would be a sad day for our republic if street protesting of grievances ceased to exist. Crossing Exposition as an Expo Line train is halted at it's station. Continuing north crossing Exposition, the Expo Line, with at one train visibly present, was halted as we passed. Soon afterward we came upon the Crenshaw bridge over the Santa Monica I-10 freeway, where the protest march slowed to congregate, and block and hold the on and off ramps. After a few moments there, a split in tactics that people were calling for developed as I heard a few call out to sit and hold the intersection, while some called to take to the freeway itself. I found myself in the middle trying to figure out which way it would go, but the prevailing sentiment went with many marching onto the freeway and so I followed. In our car culture, few things are more assertive and commanding of attention quite like halting a freeway. The way my live tweets and photos of marchers on the freeway reverberated around the internet, by supporters, by bitter detractors, and major media sources, was testament to how iconic taking to a freeway can be. This was echoed in protesters that took to the freeway in Houston and Oakland on Monday night protests. The presence on the freeway was not allowed to last for long as a line of LAPD officers formed ahead to prevent further progress, although I did spot at least one person on a bike beyond the line, enjoying a bit of taking the lane, as in all of them. A few wanted to stay and hold position there, but there were many calls urging to get back up to Crenshaw to continue marching. This is where I wished I rode out with a lighter bike as I hiked up the steep embankment, to get up to the 10th Ave. Bridge, with no entrance ramps. My gratitude to those who helped me out, & got my bike safely over the wall. Demonstrators that took to the 10 freeway hike back to the surface streets. Up top many watched in awe that this had really just happened, and as the I-10 remained closed to through traffic in both directions for several minutes even after all the protesters had left the freeway. The LAPD gradually returned the freeway to normal operation. Once back at the street, this is also when I started noticing retweets and mentions piling up on my phone, requests to post images, and a few messages I’d put in the ugly trolling category of calling for racially motivated vehicular violence to run people down. In considering the freeway as a site for protest action, it’s worth considering the racial lines by which the freeway system was constructed in the first place. The neighborhoods with more wealth, affluence, and political clout, mostly white, were able to halt projects (as Beverly Hills did), or push routing choices toward those with less means of resistance. That process of bringing the freeways and interstates through already developed areas often disproportionately destroyed homes, displaced families and divided neighborhoods that were and often continue to be predominately inhabited by African America communities and people of color in Los Angeles. This was certainty the case all along the Santa Monica Freeway’s path to the coastline. Including the splicing in half of the Santa Monica Pico Neighborhood where I currently live, which was and remains (although formally more so) the most demographically diverse slice of this 8 ½ sq. mile municipality by the sea. Where many of those bold lines on the maps were drawn, especially the bigger grander 2nd wave of urban freeways, were often chosen by which paths through communities were deemed most expendable. These projects were fueled by state and federal dollars enabling a scale of mass property acquisition, grandiosity and recklessness quite unlike any urban road building that had ever come before. Those homes nearest the freeway that were spared the bulldozers were reduced in property value and their air tainted by a barrage of harmful motoring particulates that continues to harm lungs invisibly downwind even as the era of thick and obvious smog has receded from years past. The history of the urban freeway in America is an ugly legacy, intrinsically tied to housing destruction, displacement and devaluing of neighborhood’s of color and facilitating the convenience of white flight to the then new select commuter suburbs. Although many now give little thought to the concrete they pass through while driving and how and why it got where it is, there are many things about our present that cannot be fully understood without at least a cursory knowledge of that history. Following the march on the freeway, there was a regrouping back onto Crenshaw, but a police line blocked movement north of Washington Blvd. To the south it was clear LAPD wasn’t about to allow any movement in the direction of the freeway entrances. A number of people back tracked and turned off to the side into neighborhood streets, where the group I was in made it over to 10th St. near a parking lot where another police line was fanning out to block going north. Protesters of this now smaller group were being forced back. I heard a few non-lethal rounds fired, of which type I am not entirely certain, and have heard conflicting reports on. But I was not close enough to the front of things to confirm if anyone was hit directly. Throughout the day’s events I was always much more fearful of what police might do or initiate, than what anyone who was part of the demonstrations might do. Marching on Washington Ave. toward Western. As many of those involved in the protests fanned out into the neighborhood away from the police presence, some reemerged onto Washington Blvd., where I found myself back in an environment resembling a march. The group was whittled down in size from the several block lengths filled with people at the start, but those that made it this point went on for the long haul. Occasionally picking up new people along the way, the march took a route that went up Western Ave., cut back west across Wilshire Blvd, and then north on La Brea Blvd. toward Hollwood. The police appeared to be taking a more hands off approach from this point, letting marching continue unimpeded until Hollywood. Some people with cars that got caught up in the march became driving participants along Wilshire Blvd. & La Brea Blvd. Near Western and Wilshire, a few trailing cars became part of the mix, with occupants that hung out the sides, arms raised, rolling slow, and becoming very much participants in a manner that reminded me of cars in parades. The development of having cars driven calmly amidst a protest was not something I can recall seeing before. Oh Los Angeles. At Hollywood and Highland, everyone gathered to control the center of the intersection, reigniting chants and holding signs high before throngs of curious tourists and onlookers strolling the Walk of Fame. By this point things had been going for nearly 7 hours, but energy remained high. After an extended breather, progress continued down Hollywood Blvd., with numbers starting to pick up again from people who joined in along the pedestrian heavy and subway connected corridor. Turning down Argyle a small group did turn and walk through the valet loading area of the W Hotel, but in looking back at media coverage of events, it appears false claims were made by NBC, almost rooting for there to be damages, with claims that the march “stormed” the hotel and entered the lobby, causing $15,000 in property damage. I saw no such thing from where I was standing at the sidewalk watching, and according to at least one writer who followed up with hotel management, and was covered in Salon, the hotel disputes the damage and lobby claims. With how often I’ve seen significant disparities between official or reported accounts and what I could see with my own eyes, I’ve learned to treat most fly by coverage with a great deal of skepticism. The group that looped through the valet area came back out quickly, called out by others that stayed in the street urging to keep things off private property. Justice for Trayvon demonstrates converge at the CNN building on Sunset Blvd. It just so happened after passing the W Hotel, I heard some call outs to head to the CNN tower on Sunset Blvd. nearby. I don’t know if this was preplanned, spontaneous or related to Jay Rosen at all. There was a certain irony in watching television monitors that wrapped the ground floor with talking head reactions to the Zimmerman trial, with no indication of protests in multiple U.S. cities, including the one I happened to be in right there in front off of their Los Angeles building. LAPD stands guard in front of the CNN tower on Sunset Blvd. When attention shifted away from the building itself to a police blockade that arrived to control the intersection, I also noticed helmeted officers with clubs had come in through the side in formation across the front face and entrance to CNN. This made for a somewhat eerie imagery of state power standing in defense of corporate media, that was of course instantly popular with the photographers out there, and made at least one of the officers visibly uneasy at the documented attention. It was from this point that I had a feeling things would come to a close soon. A declaration of unlawful assembly was declared around the area, and people were directed to get onto sidewalks and disperse south on Cahuenga Blvd. After some internal contention and discussion most of those assembled, and now penned in by LAPD, complied with leaving the streets to gather on the sidewalks on Cahuenga Blvd. There were a few individuals who did not comply, staying in the street beyond allotted time to disperse. This is where things got a little hectic, and in horrible timing, my phone, and my battery extension pack, were all out of juice. Officers charged their line forward, a few tackling arrests were made in the street. What I believe were bean bag round shots were fired, and those on the sidewalk were also forced back, some of whom were surprised and taken off guard to find the police line moving at them as well. I did not witness any acts of violence initiated by those had been participating in the protest, but disobeying the commands of police authority is rarely taken lightly, and often met with a sanctioned violence and force. Route reconstructed from geo-tagging of phone pictures. Things wound down really quick after the CNN confrontation, and as much as I try to stick anything I start out to the very conclusion, I wasn’t about to push my luck any further even if some had tried to stay any further. From 4:00pm in the afternoon to 12:40 past midnight, there was continuous action for nearly 9 hours straight, and spanning along a route that came out to about 14 miles. I wondered back to Hollywood Blvd. where I had locked my bike up when the group was staying at the Highland intersection, while trying to mentally process the days events and the emotions behind it all. I don’t want to live in a world where some boys, because of their looks and skin, have to worry about being stalked as possible criminal suspects just to walk home.Where they can be killed by unaccountable paranoid men that place imagined crimes against property before empathy for other human lives. For those of us who benefit from the invisible knapsack of white privilege, in which I must include myself, we especially need to be reading further, peering deeper, and listening to others. We must act as well, but first we must spend some time listening. To be honest I’m incredibly nervous about composing this follow up and attempting to put events in context, as these are topics well outside my comfort zone as a writer. If I’m misstepping anywhere, call me out on it, I don’t want to be blundering. Complacency is much easier to settle into on matters of racial inequity when you are not daily forced to confront structural racism that works against you, or the jabbing nastiness of confrontational racist individuals in real and digital spaces (that I got just a little taste of by tweeting out from the protests). There are a lot of white males sweating bullets over the liberty infringement of the newly revealed powers of the NSA PRISM program. However privileged whites have not been the persistent focus of the racial surveillance state that has existed since the American colonial era to the present, which Urban Studies and Planning PhD student Jamaal Green discussed recently on his Surly Urbanism blog. There are systemic patterns of injustice. Sit in protesters in Florida are fighting the stand your ground legislation there because it is one part of perpetuating systemic injustice, and the real fear that there will be more Zimmerman’s, more Trayvon Martin’s. There is an unrelenting racism that at times has been so subtly woven into our societal institutions that they can harm inequitably even in instances with very few people within those institutions that could be characterized overtly as individually racist. This is true of our legal system, and it has and often continues to be true of many of the mechanisms by which urban land use and transportation decisions are made. In hind sight I realize that the majority of my writing on bikes, urbanism, car culture, transit and related issues over the past several years, on Streetsblog Los Angeles and elsewhere before that, has mostly stepped around discussing the intersections between these topics and racial inequities, even where I very much knew such connections existed because it was right there in the research I was doing. At least one small thing I resolve to do in the future, is to stop avoiding difficult discussions on uneven racial dynamics when it is relevant, just because it can be uncomfortable. The more I consider these issues deliberately, the more I realize a tendency toward a discourse of racial colorblindness, when structural racism is still embedded into our systems, institutions and infrastructure, is in fact a kind of complicity with perpetuating inequitable racial outcomes. As someone who spends a lot of time as a bicycling advocate, and concerned by traffic deaths that make up the other half of the big 2 causes of death for our youth, it was appalling to me to discover recently that the bicycling fatality rate for Hispanics in the U.S. is 23% higher than whites and African Americans 30% higher than whites. Most likely because of disparities in the built environment as well as other factors (stats from a PDF of recent Bike League report). In many of the bike blogosphere write ups following that report’s release, the figures supporting the fact that many people of color ride bikes, and that is where the fasted growth is occurring, were promoted heavily. However frequently neglected in those write ups was the unequal safety or any discussion of how this relates to neighborhood segregation and unequal deployment of infrastructure investment or educational resources. We have to be more critical about why inequities exist. We can do better, and we have a moral obligation to do better. It’s not just about tackling the biggest issues, sometimes it’s confronting the small things, the micro-aggressions that lay underneath. This essay by Isobel DeBrujah, Southern Trees Bear A Strange Fruit: Why People of Color Aren’t Surprised By The Trayvon Martin Verdict, addressed toward white people in her closing paragraphs, really hit hard for me. “The members of the Montgomery Bus Boycott walked for over a year through violence and bombings and attacks, until they won their fight. You can absolutely correct the guy in the next cubicle when he starts talking about how black people are the cause of crime, or when one of your girlfriends says she heard that Trayvon was a thug, or when anyone starts justifying Zimmerman’s fear of the child he stalked and killed. This is a great piece, thank you. It’s particularly interesting to see that picture of the 10 being built, to see how those freeways, which are so important to every city in the country, were driven right through the heart of black communities. A while back I was reading about the history of the “Chitlin Circuit” of black music venues, and in almost every single case, when I looked up the thriving black commercial districts those nightclubs were located in, Google Streetview returned a picture of a freeway wall or overpass. Not only State Route 10 (as I-10 is officially designated by CalTrans) but also SR170, the “Laurel Canyon Freeway”. Guess which part got built? The Trayvon case was not simply about Z walking up and shooting him. There was overwhelming evidence that T was on top of Z beating the shite out of him. Both T and Z should have walked away before it got physical. More victim blaming, more ignorance of the fact Zimmerman stalked Trayvon in defiance of a direct order by police not to do so. It is not illegal for you to keep an eye on someone you find suspicious in your neighborhood.. even if a police *dispatcher* suggests you don’t. It IS illegal to pummel someone’s face into the ground, breaking their nose and smashing their head into concrete. The prosecution didn’t even attempt to deny this was fact. Though a tragedy, Trayvon is not innocent in his own death. For anyone who is being followed down a dark street on rainy night. Every self-defense course in the world tells you to stop, turn around and let the pursuer know you know that you are being followed. Don’t reach for your phone because it could be assumed that you are reaching for a gun. Don’t run and begin a deadly cat and mouse game either this may be exactly what the pursuer wants. Do exactly as Trayvon did. Speak loudly and firmly and if approached kick him/her in the pubic area and defend yourself with anything on your person or lying around. Ask questions later once you’ve gotten away to a safe place. Note: This doesn’t work if you happen to be a 17 year-old black kid though. There is no such thing as “unlawful assembly” in the United States: the First Amendment makes that very, very clear. Does *anyone* trust the LAPD any more? I’m not even sure it’s racism any more — in a bunch of places, including LA, the cops will just blindly shoot people at random, as we know from the two people whose van they shot up a number of weeks back. Yes, that was when they were hysterical about Dorner — *who was explicitly targeting criminals in the LAPD who had abused citizens*…. The prosecution threw the case deliberately. Remember, this is Sanford, where they weren’t even going to *arrest* Zimmerman until there was a public outcry. Zimmerman had no evidence of injuries. Apparently, you were not paying attention. When the cops picked him up, he had a bloody nose and lacerations on the back of his head. The next day, a doctor determined his nose was actually broken and he had two black eyes. You can even see the injuries on the police video when they brought him in the night of the shooting. Jerry Browned, Doored, and Jerry Browned Again…Rough Afternoon on Pico Blvd.